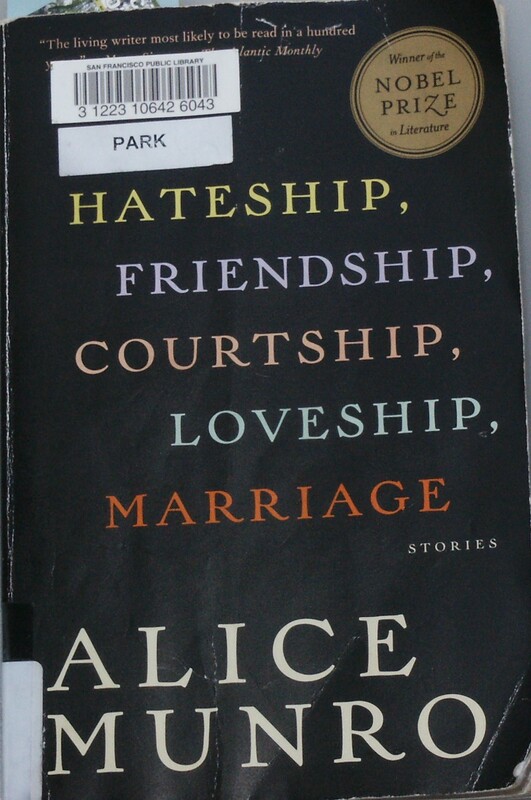 "Hateship Friendship Courtship Loveship Marriage"
This collection of nine short stories by Alice Munro showcases her mastery of the form for which she was given a Nobel prize for in 2013. The Nobel prize is for her short stories in general rather than just this particular volume, however this collection also won a New York Times Editor’s Choice Award in 2001 for the top 10 books of 1996-2000. She has won numerous other awards including the Man Booker International Prize in 2009. Each of the nine stories is a stand-alone piece although there are certain commonalities running throughout all as to settings, themes, and types of characters. They all take place in Canada, mostly in Ontario province or the Vancouver area. Many feature life on the farm or in small towns. The time periods are the 1950’s through the 1990’s. The characters tend to be ordinary middle class or those struggling below the middle. Many of the stories involve married couples with complicated extra-marital romantic interests. Themes of aging, death and dying, bereavement, and the nature of close human relationships are examined. Stylistically, the writing is straight forward with attention paid to the nuances of communication and the psychological layers of the characters. The endings open up space for contemplation rather than clear-cut resolution. The title is derived from the title of the first story which itself is the name of a game played by two characters, and alludes to the relationship themes throughout the book. My two favorite Stories are: “Comfort” and “The Bear Came Over the Mountain”. In “Comfort” a high school biology teacher is harassed by creationists and eventually is forced to resign. In the meantime he comes down with ALS or Lou Gehrig’s disease. His wife struggles to follow his wishes after they have made his end-of- life plans which tie into his conflict with religion fundamentalists. An outside romantic interest crops up to further complicate issues. In “The Bear Came Over the Mountain” a woman develops Alzheimer’s disease after many years of marriage and her husband, who in his younger days had some secret affairs, is forced to enter her into a nursing home. She forgets who he is and develops a close emotional bond with a man who is another Alzheimer’s patient, who is similarly married. The two healthy spouses meet and also develop a relationship. The ending is goose-bump worthy.